The riots in the Indian state of Haryana have led to the deaths of at least fifteen people, with more than 100 injured in the past two days. 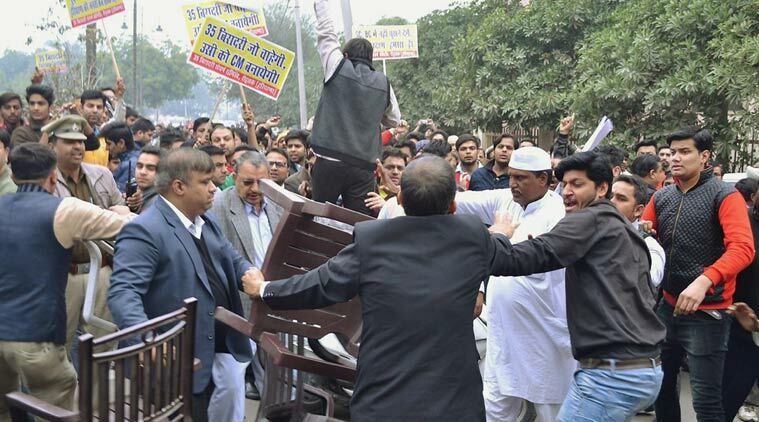 Representatives of the ethnic group of Jats carried out the protests. They make up almost a third of the population in the predominantly agrarian state in the north. Western media reported that the authorities’ policy and external factors led to a decrease in their standard of living, and the Jats sought from the government to increase the quotas for seats in the state apparatus and institutions. At the moment, more than 10,000 soldiers and militiamen are trying to pacify the protesters. The Jats protests prevented business activity in Haryana. More than 500 factories were closed, 850 trains cancelled. Business losses amounted to more than 2.8 bln Dollars. Jats blocked roads and threatened members of other communities, urging them to join their protest. Jats do not quite fit into the Varna / caste system of traditional Hinduism. They call themselves "Kshatriyas" - representatives of the second-class significance of warriors and rulers. However, many Hindus believe Jats are "degraded Kshatriyas", which, in view of the long-term separation from the Brahmanical rites, descended to the status of Sudras - wage laborers and servants. During demonstrations in the north of India, protesters damaged equipment of the Munak channel - the main source of drinking water for the metropolitan territory of Delhi. Because of the traditionally difficult sanitary-epidemiological situation in the Indian cities, such actions may be regarded as a diversion, especially before the hot months arrive. In the cities, school classes were cancelled; the authorities are trying by all means to keep the situation under control. According to the latest information, the army managed to regain control over the channel. On Sunday, the Indian government made concessions to the protesters, but it did not stop the mass protests. In today's India, and in other centers of the multipolar world, there is an ever more clearly looming confrontation of forces, between traditionalist and liberal groups. At the head of the first is Prime Minister Narendra Modi, the latter representing a complex system of left, liberal and pro-Western secular organizations and communities. Under their control is the main part of the educational institutions. Traditionally, these groups are betting on lower castes in Indian society. Riots on caste grounds are one of the ways to pressure Modi. He is a member of the traditionalist conservative party BJP, which adheres to the ideology of Hindutva, Hindu nationalism. The caste system is illuminated by a centuries-old tradition and is closely associated with Hindu religious worldview. Therefore, representatives of Hindu organizations such as the BJP are always a handy target for attackers who are trying to put pressure on the lower castes that do not agree with their low social status. Despite the fact that the BJP assurances that they will fight for the improvement of the living conditions of members of the lower castes, this rhetoric is perceived with suspicion due to the faults of the local administration. The rise of the Jats is coming against the backdrop of demonstrations on the "freedom of speech" in Delhi and other major cities of the country. On February 9th 2016, Jawaharlal Nehru University students staged a rally in memory of Afzal Guru, one of the terrorists who was attacked in 2001 at the Indian Parliament, and the Kashmiri terrorist Maqbool Bhat. At the meeting there were calls for the destruction of India. Later, authorities decided to arrest 6 students of university on a charge of sedition, among them the president of the Democratic Student Union of the University Kanhaiya Kumar. They were accused of sedition, which is punishable by life imprisonment in India. However 5 others beside Kumar escaped arrest and today are on the territory of the University campus. The police cannot enter it without University permission, but the left-liberal University hesitates to approve their entrance. Representatives of the left and the liberal opposition immediately accused the government of suppressing their freedom of speech. In Delhi and other cities of the country, mass demonstrations of students were organized. Modi was accused of flouting liberal values and the attack on one of their main strongholds in the capital. Foreign media were in support of the student; they accused “Hindu extremists” of the repression against the innocent "kids". Government supporters organized a counter-demonstration and demanded to punish the enemies of the country and representatives of the fifth column. Representatives of the opposition parties put pressure on Modi, demanding the revision of the law on inciting sedition. In response to the increased pressure from left-liberal structures Modi, on Sunday, bluntly stated that the anti-national forces are preparing his removal. As we predicted before, the West is increasing the pressure on the Indian Prime Minister, using a color revolution technology. The main geopolitical reason is his rapprochement with Russia and plans to make India one of the pillars of the multipolar world system; there is an ideological war ongoing too. Modi’s Hindutva is incompatible with western liberalism as an ideology of American and western hegemony. The left and the liberal opposition structures, including young people and students, play the leading role in this process as it was in Ukraine and Arab countries during the "Arab spring". Termination of water access in Delhi can be connected with the protests against the government representatives of other segments of the population. It is likely that the mass protests in Delhi will be supported and guided by the authorities of the Capital. In 2015, the Aam Aadmi Party, «the average person party”, created by activists of the campaign in 2011 "India Against Corruption", came to power in Dehli. "India Against Corruption”, in its structure, working methods and slogans, was similar to the protest movements of the "Arab Spring." The party is in opposition to the country's leadership and adheres to a left-liberal political orientation. In response to the threat of a "color revolution" Modi responded by mobilizing his supporters. However, it can speed up the mobilization of his opponents, especially in the capital and regions, where Bharata Janata Party's position is not so strong - in the south and east of the country, as well as in Kashmir.